A condition called Dupuytren’s contracture causes an ongoing, abnormal thickening of the tissue in the palm of your hand. Over time, a rope-like cord of tissue may pull the finger permanently toward your palm. This bend, called contracture, can reduce your range of motion — how much you can move and straighten your finger. XIAFLEX® is the only FDA-approved nonsurgical treatment for adults with Dupuytren’s contracture with a cord that can be felt. 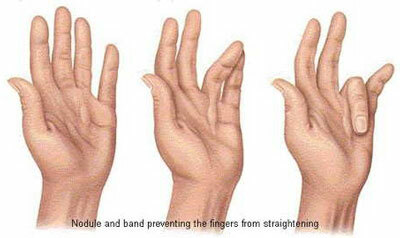 XIAFLEX is a medication that is injected into the hardened tissue (cord) of the affected hand by your doctor. You’ll go home with the hand wrapped in soft gauze with instructions to not move the injected finger until your doctor tells you it is okay to do so.